If I call you a Pig-Skirted-Hog-Mistress, you might be offended. But I have every right under the U.S. Constitution to call you that and any other name I choose. How we react when we feel offended by verbal abuse hurled in our direction, is completely up to us. Freedom of speech is a guaranteed right, but freedom from offense is not. Sometimes we forget that we’re in charge. We forget that feelings are emotions, and we can decide how we respond. For some weird reason, I sometimes find myself calling my dog Chicken-Lips, but she doesn’t seem to mind, in fact she wags her tail in apparent delight. She chooses not to be offended by any of the silly names I call her. If someone calls me a jerk, that does not mean I’m a jerk, it might not even mean the person thinks I’m a jerk. How I react is up to me. I might laugh, but whatever my reaction, it is mine and I own it. If my anger takes over, it’s because I lack control of my anger. Calling someone a jerk is allowed under our laws, but punching someone in the face is not. Children are less likely to have learned this lesson. Adults are supposed to have matured, which means their brains have developed constructive strategies for dealing with their experiences and their emotions. Our actions should follow reason, no matter how justified our emotional response. Back in the 1960’s a misguided do-gooder, who was actually a law professor, petitioned the FCC (Federal Communications Commission) under its Fairness Doctrine to require broadcasters to provide balanced programming whenever addressing controversial issues. In responding to this petition, the FCC commissioners thought they could avoid offending people by controlling what was allowed to be said over the public airways. It took about two decades for the courts and common sense to rectify the harm from this absurd attempt to control speech. There is an excellent opinion piece in The Wall Street Journal today by Robert Corn-Revere, Free-Speech Foes Call an Audible: Bringing the FCC into the ‘Redskins’ debate is an invitation for First Amendment mischief, providing some historical perspective and explaining why such inclinations to control speech are dangerous and also unconstitutional. I fail to comprehend why someone would feel offended when they hear the word Redskins spoken on the radio or television, or even if they are in the stadium. It is an irrational response. No one in the audience is being called by that name. We would expect that everyone associated with the team is proud to be considered one of the Redskins. There is nothing inherently derogatory about red skin, white skin, black skin, purple skin, green skin, or brown skin. They are just rather inaccurate descriptions of various skin colors. Are some colors good and others bad? In this case, it actually refers to the red paint that brave warriors put on before going to battle, not to the color of their natural skin. Seems like a good name for a football team entering an athletic contest. Ironically, the team colors are burgundy and a yellowish hue. Perhaps they should change the team name to the Burgundy Integuments. If someone is offended by Redskins, perhaps someone else is offended by Cowboys. (See my most recent post on Reactions at DocStephens.org) How about the Cleveland Indians, who are mistakenly named after a sub-continent half-way around the world. Should we cease calling Oklahoma by its name when we find out it means “red person.” How about the Hoosiers of the Indiana University? Isn’t it about time we corrected that Columbian blunder, and surely, Hoosiers can’t be a good thing. Some people seem to find joy in being offended. I consider it a character flaw. Why should I allow anyone to control my emotions or my reactions? For God’s sake, keep the FCC and the government out of this and similar issues. If you can’t stand hearing the word Redskin when watching a football game, change the channel and go see a psychiatrist. Oops! I hope I didn’t offend anyone. This entry was posted in Human Behavior, Media, Musings, Politics and tagged Cleveland Indians, Cowboys, FCC, Federal Communications Commission, First Amendment, Free-Speech, Freedom of Speech, Hoosiers, Indians, Oklahoma, Redskins. Bookmark the permalink. 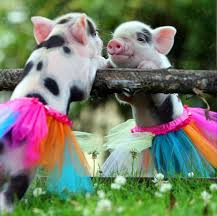 Love the piggy picture! How adorable! Good thing I don’t care for football! Who are the redskins?? Love the article about the Constitution and the freedom of speech!